My long term goal is quilts and casual clothes, but for now it's pillowcases and bags and aprons and *more bags*. I am not complaining bags - are a delight, and oh-so-giftable, and I'm actually going to make a new shower curtain because we need one and it looks *easy*. 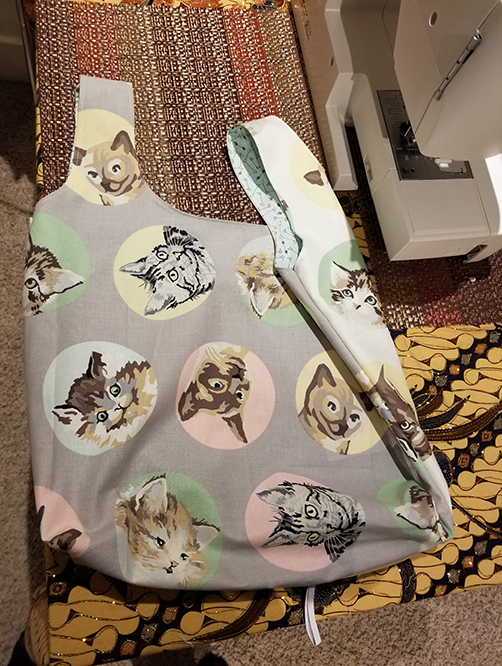 Anywho I wanted to make a gift for one of my good friends, so I made her a cat-themed portable reuseable grocery bag. Very forgiving project, found here! I'm quite pleased; I think it's cute, although that's largely because of the fabric. But now I want to make more, mooooore.... but now I must go on to zippers, scary scary zippers. Those little faces! I can't even.